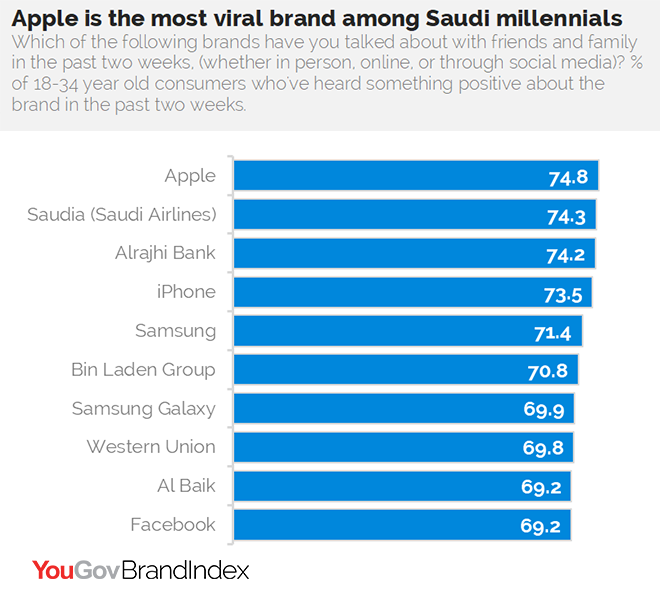 on October 20, 2017, 2:04 p.m.
Social media giant Facebook is the most positively talked about brand among millennials in the UAE and Egypt while Apple receives the same accolade in Saudi Arabia according to new data from YouGov BrandIndex. YouGov’s daily brand tracking tool, BrandIndex, considered the opinions of respondents aged between 18 and 34, collected online over the past year in all three middle east countries independently, to discover the 10 brands they’ve talked about the most positively with friends and family, whether in person, online or through social media. Among one of the largest and most tech savvy generations in the world, there’s no surprise to see iconic social media, tech and mobile brands feature in the top 10 brands in all three countries. Facebook ranks in the UAE, Egypt and Saudi Arabia, while instant messaging phenomenon WhatsApp ranks highly for millennials only in the UAE. Apple’s proving its viral strength in Saudi Arabia and the UAE, ahead of rival Samsung. Likewise, their trademark smartphones score highly in all three countries, with iPhone ranking within the top five in the UAE, Saudi Arabia and Egypt, above Samsung Galaxy. Quick-service restaurant chains are demonstrating strong resonance with this age group across the board with the likes of Al Baik in Saudi Arabia, and KFC and McDonald’s in the UAE and Egypt making their mark. In Egypt specifically, food and beverage giants Pepsi and Chipsy are also making a name for themselves among this tech savvy group. Banking and travel are also proving to be prominent topics of discussion with airlines Emirates and Saudia generating chatter among millennials in the UAE and Saudi Arabia respectively. Meanwhile Emirates NBD leads share of voice among banks in the UAE and Al Rajhi Bank in Saudi Arabia, while both The National Bank of Egypt and Bank Misr are the most favourably talked about banks in Egypt. For this ranking, YouGov BrandIndex first screened all of its brands in the UAE, Saudi Arabia and Egypt independently for positive Buzz, which asks respondents, "Have you heard anything positive about the brand in the last two weeks, through advertising, news, or word of mouth?" Brands with low response volume were eliminated. From those brands, they were then ranked on Word of Mouth scores, which asks respondents "Which of the following brands have you talked about with friends and family in the past two weeks (whether in person, online, or through social media)?" All respondents for this research were adults 18 through 34 years old. Data was collected between September 1, 2016 and August 31, 2017.